On Sunday morning, I lounged around my Guesthouse in Bangkok before heading to the airport and hopping on my 1 hour flight to Chiang Mai. I booked this flight in my original group of flights and didn’t really think much of it. However, once I got to Bangkok, I realized just how cheap and frequent the buses are, and have taken quite a bit of teasing for flying. However, I did get a really good sandwich on the plane, so I guess it was worth it! I arrived in Chiang Mai at 1pm on Sunday and stepped out of the airport into 35C sunshine and much cleaner air then in Bangkok. I took a look around and realized that I had no idea where I was to head. I got into a taxi and was asked where I wanted to go, to which I said “where should I go?”. The cab driver was really chatty and brought me to the center of the old town where there are tons of guesthouses. I found one right away that was only 100B (just over $3), had wifi and hot showers. So I dropped my bag and took off for a wander around town. 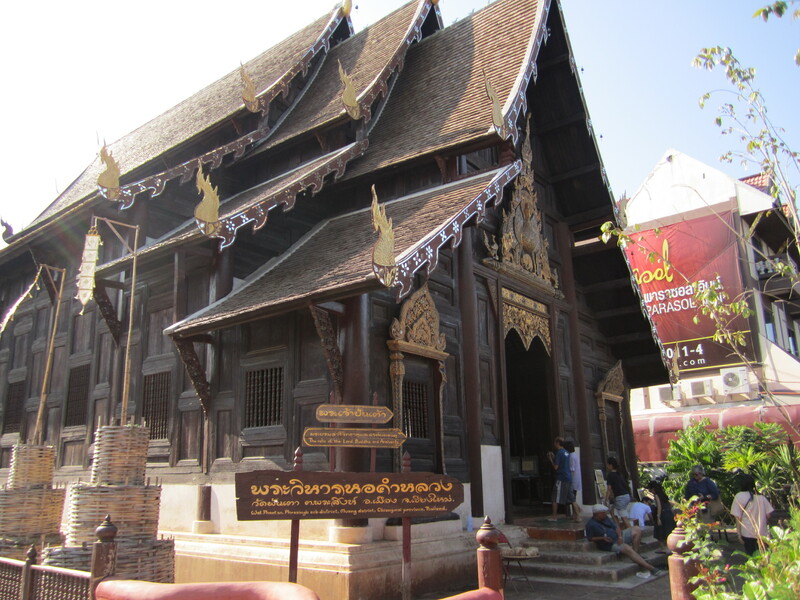 Chiang Mai is an ancient walled city (from the 1200’s), however most areas of the wall are now gone. The old town is still surrounded by a moat with gates along each side. 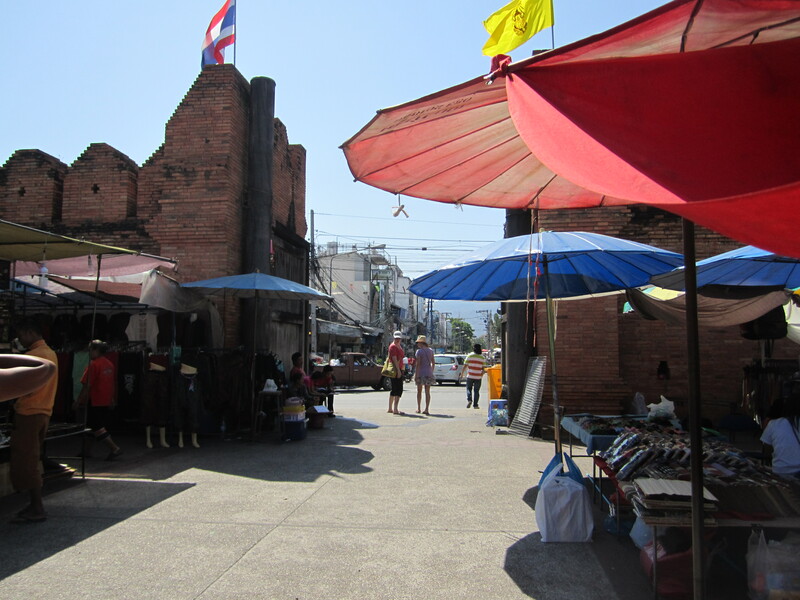 The main gate (Tha Phae) is the starting point for the Sunday Night Market. I can’t say no to a good market, so I headed off to check it out. What an amazing experience. The streets were packed with people checking out the tables covered in clothes, jewellery, handicrafts and so much more. There were people performing in the middle of the streets and street-eats everywhere! I had another amazing dinner of papaya salad. Since that meal, it seems that I haven’t stopped eating since arriving here. I headed back to my room after getting totally tuckered out at the market and chatted my my new roomie for a while. She is from Montreal and has been travelling in Asia for about 8 months. She had great stories and tips for me. 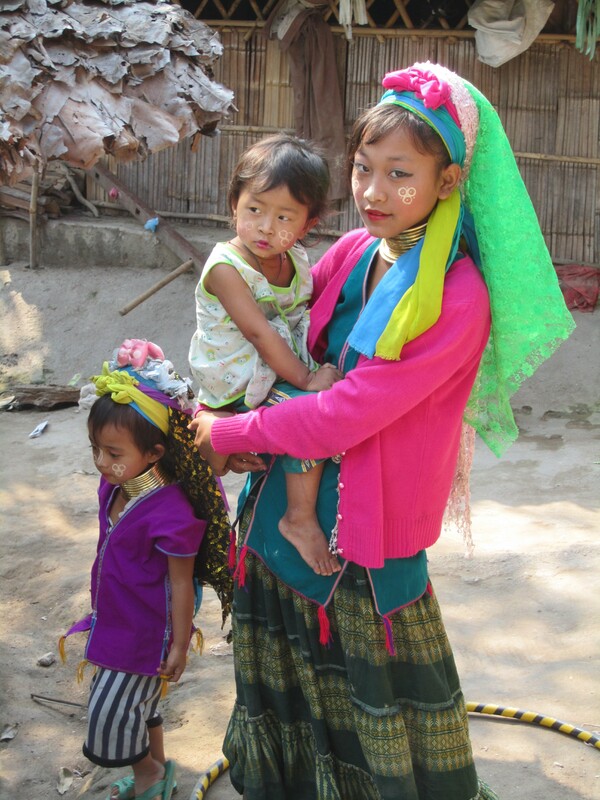 We may even see each other in Laos soon! She headed to the boarder after my second night and I had the room to myself. At first I missed having someone to chat with, but I soon fell into my own rhythm here. There are cafes everywhere and the wifi is pretty good, so I wandered around visiting the awe-inspiring Wats and stopping for a fruit shake and a google search when I started to get hot. I even rented a scooter for a while and toured myself around on that. I have never driven a scooter before, I had had to convince the girl renting them to let me have it and to teach me how to ride it. After my 5 minute lesson, I set off. Sooooo much fun! 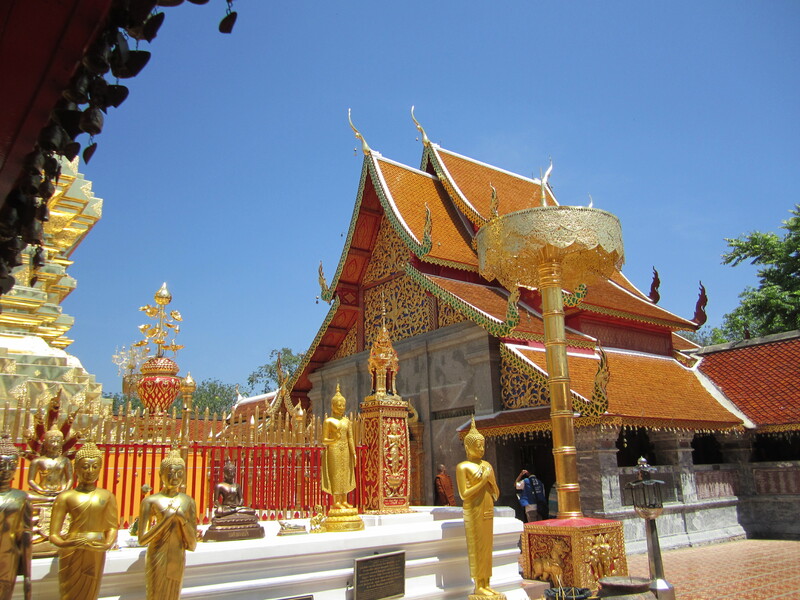 To the northwest of the city is Doi Suthep, a temple built up on the top of the hill overlooking Chiang Mai. From what I had heard it was worth going to see, so I jumped in the back of one of the many converted pickup trucks around town and rode up the steep, windy road to the Wat. When I arrived, I stopped and looked up the 309 stairs, took a breath and started climbing. I am so very glad I decided to go to this Wat. I was blown away by the massive gold spire and the beautiful temple buildings, but it was my time with the monks and learning about the history of the Wat that made it so memorable. I went up to Doi Suthep thinking that I would be there for a short time before heading back to town, but I ended up there for most of the day. The next day was spent comparing local spa prices and treating myself to a little pampering. I also decided to start comparing the different trekking packages and prices to head into the hills. There are over 200 tour companies in Chiang Mai and they all offer very similar trips, so the trick is to sort out which ones go to the better locations and what the best price is for the company you pick. They are all very tourist orientated, and there are many people who choose to do their trekking elsewhere in Thailand for that reason. The main choices included trekking for 1,2 or 3 days, swimming in waterfalls, vising the Karen Longneck tribe and the other local hill tribes, going to the Tiger Kingdom, riding Elephants or learning to train Elephants, going to the snake farm, white water rafting, bamboo rafting, visiting the Orchid farm, visiting many of the Wats, and on and on. I have heard many stories about the treatment of the Elephants at the tourist places, and have been advised against taking part in that. I also learned that the tigers are heavily sedated and dragged into positions for visitors to get pictures with them, so I decided against that as well. I ended up signing up for a trip to see the Orchids, hike, swim in a waterfall, visit the Karen longneck tribe, and go whitewater rafting with bamboo rafting at the end. The trekking company picked me up at 8am, along with a girl from Poland and a guy from Scotland. We had an amazing day, and decided to get together in the evening to head to the night market. While at the night market, I felt my second earthquake on this trip. Chiang Rai had a 6.7 quake that was felt as far as Bangkok. I had been thinking of leaving Chiang Mai early and going to Chiang Rai to do my trekking there. Once again, a random decision (to stay in Chiang Mai) kept me out of the earthquake zone. I am a truly lucky girl! That night, I had 3 new roomies check in (2 from Sweden and 1 from Canada). I spent the whole day on Friday with them wandering around, eating and having a great time. We even tried Chicken Foot! (accidentally). I also discovered that Cory, the other Canadian, grew up in the town my mom grew up in and that our Grandmothers lived on the same street. It amazes me when things like that happen! While sitting at a table on the edge of the river, we met a Scottish girl named Fiona who now lives in Japan (in Thailand to get away from the disaster) and decided to go out dancing. What a great night! I am now on my last day in Chiang Mai. I will be getting on an early bus tomorrow to cross the border into Laos. Once I am there, I will be heading into the jungle for 3 days of ziplineing and searching for the mysterious Gibbons. Everyday, I have moments of complete disbelief that I am really here and really doing this. I am seeing so much and experiencing so much that I can’t possibly write about it all, but I can say that this is an extraordinary adventure and everyday I feel so fortunate to be able to be travelling! This entry was posted in Thailand, Traveling. Bookmark the permalink. First I am glad to hear all is ok re: earthquake! you truly have horseshoes up your a**. Nate is now saying ‘maybe Kerri should do China on her own at a different time than us as the earthquakes seem to want to follow her’ (don’t worry he is just kidding lol!) if anything i told him we want you there as you are as you said ‘a very lucky girl’! So for the rest of your blog – no words but awesome – i lov ethat you asked the cabby ‘where should i go’!!!! 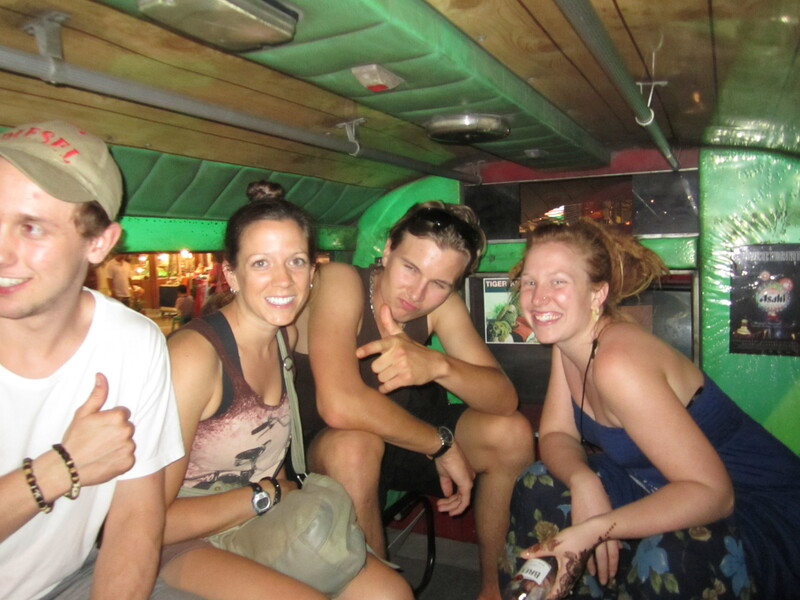 keep safe and ENJOY Laos – i really can’t wait to hear about this leg of your trip! thinking of you!!! Kerri, you are a brave lady. I am thoroughly enjoying your updates and the beautiful pictures. What an amazing experience! Stay safe, but continue to have a wonderful time. Sounds like a blast Kerri. I’m totally jealous. Have fun up in the trees.